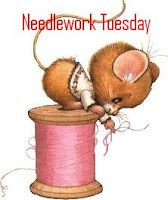 Welcome to my regular Needlework Tuesday post. This week, I have a special treat for you. Recently I have become acquainted with crochet artist Kelly Lynn Smith. I call her a crochet artist, because what she creates with yanr and a hook, are truly breath taking pieces of art. Kelly started out designing award winning dolls, many of which have been featured in in a variety of doll magazines. A few years ago she turned her nimble fingers toward crochet and hasn't looked back. Last week, I sent her a few questions and I have included those below. Kelly has included links to the works referred to. You really do want to click them and take a look. Heather: When browsing your site, I could help but be attracted to your lifelike dolls. How did you make the jump from doll making to crochet artist? Were you crocheting clothes for them and it then became a natural progression? Kelly: I just started crocheting in 2011 after having a knee replacement. Due to some complications, it was not the normal recovery period and I am not one to have idle hands. To date, I have not made any crocheted doll clothing. I started with a few patterns that I purchased online and then started designing my own. Heather: Dog snoods? This is a first for me. The afghans hounds are lovely on their own, but when you add a snood, it provokes all sorts of questions. What lead you to costume your dogs in such a manner? Heather: I love your sea creatures. They combine realism and whimsy. Why sea creatures? Kelly: I love sea creatures also and if I could be anywhere, it would be on a beach. I've kept salt water tanks in the past and while gorgeous; there is a good deal of work and expense involved. My concentration is working with the dogs at this time, so the crocheted sea creatures still let me keep that interest without all of the upkeep. I've also donated several to Hyperbolic Reef Projects. My sea creatures were specifically requested for the Hook the Reef project in Hawaii and have been on exhibit with their display twice. I also have a piece currently with the Roanoke Valley Reef in VA.
Heather: Do you have a favouite brand or type of yarn/wool to work with? Kelley: I'm not sure why but I seem to have a predisposition for selecting discontinued yarn. LOL It's a habit that I'm trying to break. I like acrylic, bamboo, silk or cotton yarns with texture and visual appeal. Unfortunately, I discovered during my explorations into spinning that I have a severe wool allergy. So, while I admire many of the wool yarns--it is now from a distance. Heather: When designing your crochet creatures, do you start with a concrete plan, or do you let the yarn and hook speak to you? Any hints you want to share about what you will be working on next? Kelly: I have a very specific design in mind when I begin. I have no formal design training but have worked as a professional designer prior to marriage and have been able to envision three dimensional finished products in my mind since I was a child. It is something that I cannot adequately explain other than to say that it flows and the idea in the mind matches and comes to fruition in my hands. I can only attribute it as a gift from God.My most personally challenging project to date was the Sugar Plum Fairy which combined my love of doll making with the art of crochet. I wanted something proportionate, poseable and detailed in a small (11.5" tall) package. She required much thought and planning but I completed the prototype in a day and a half. Plum's arms and legs can be posed in a variety of ways and she has individual fingers. I want to eventually make an entire Corps de Ballet in various poses but got sidetracked on some other projects. Yes, I will give a little hint on my next project. It is a wearable and mostly worked with 2-dimensional elements which is torture to me. I want to grow as an artist, so am always trying new things and pushing the limits. Thank- you for sharing about yourself and your works. They are incredible. I know that I will be following your crochet adventures via your Facebook page and encourage my readers to do so as well. The following video features Kelly's latest designs, the crocheted Reef. These patterns are available individually or as a set from her etsy site Angels Unawares. As part of my 1000 post celebration, Kelly has most generously donated a pdf copy of the complete pattern set of Wings of the Morning. It's a 67 page Photo tutorial download with a value of $21.99 US. Contest closes Feb. 7, 2013. 2: visit Kelly's Facebook page, Like it , then return here, leave a comment including your Facebook name. Thank-you so much to Kelly Lynn Smith for visiting with us here at Books and Quilts and for donating the Wings of the Morning pattern set. What a talented lady &she has only been crocheting since 2011! What a creative and talented person! I try crochet every now and then, but that one needle gets me every time. Excellent interview! I am in awe of anyone who can crochet. Lovely interview - maybe it will inspire me to try crochet again.